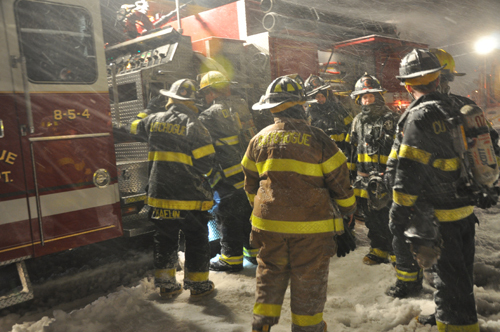 COURTESY PHOTO | The Cutchogue Fire Department rescued a family from a basement fire Friday night during the blizzard. A Cutchogue family had to be rescued from its basement Friday night after a transformer wire broke, sparking a fire, Cutchogue Fire Chief Dave Fohrkolb said. At about 10:30 last night, Cutchogue Fire Department received word of smoke in a residence on Tuthill Road, Mr. Fohrkolb said. The family — two adults, two small children and their dog — were safely rescued from the home, as volunteer firefighters made their way to the basement, Mr. Fohrkolb said. “We stretched a hand line into the basement,” he said. “We were able to extinguish the fire within 5-10 minutes. About 36 volunteers made it to the scene. Their work wasn’t done yet, when the realized other homes could be at risk as well, the chief said. A primary wire from a transformer pole had broken, and it “energized” a Cablevision wire going into the home, Mr. Fohrkolb said. The Cablevision wire was also going into other people’s homes, he said. The broken wire affected 10 homes in all, he said. The whole operation took about two hours, he said. Within a half hour Long Island Power Authority was on scene to repair the wire, Mr. Fohrkolb said. COURTESY PHOTO | Cutchogue firefighters faced brutal conditions last night during a rescue.